Audace, Unlisted Collection’s latest restaurant, is short for Audacity. It’s taken over the space that used to house the well-loved Cocotte, and has Michelin-starred Chef Jérémy Gillon at the helm of the kitchen. Audace Bar & Restaurant aims to serve up contemporary French bistro food using ingredients sourced from nearby Tekka market, and aims to eventually expand that ingredient list to include regionally sourced items. Chef Gillon did this type of grassroots sourcing when he was in the French Alps, earning his star at La Montana. So, one must wonder if the Tekka market ingredients are working out for him in his opening days in what must be a very different operational environment for him. My meal started with the Green Pea Salad. 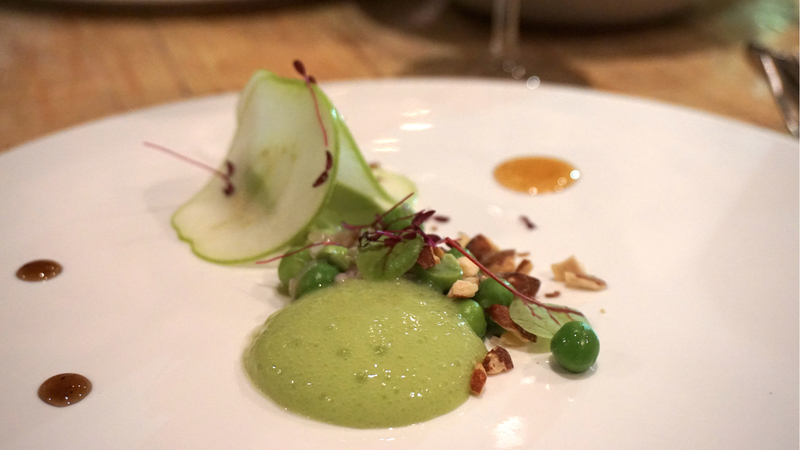 This dish actually felt more like “Peas and Apple, both done 2 ways”. I initially thought that the green foam was made out of peas, but was pleasantly surprised when I dug in to find out that it was actually made out of apples! I was also delighted at how the almonds went so well with the peas. I think that the more bombastic flavours of the meal stand out to most people, but the sublime flavours are the ones that people remember long after they leave the restaurant. 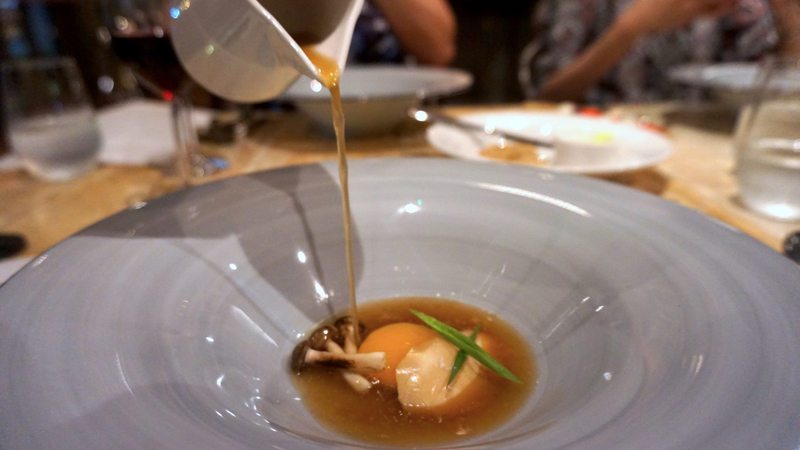 The Egg Yolk & Foie Gras Confit with Mushroom Consommé is that dish. Vibrancy of the egg yolk aside, that (less than optional) Comsommé deserves your attention. I poured it into the dish, then broke the egg before I dug in. The gentle warmth of the liquid and the silkiness of the egg went well with the uncommonly smooth texture of the Foie Gras. This is not the Foie Gras you’re used to, but it’s a Foie Gras you can get used to. That high is followed with the Braised Octopus. Now, I approve of the grilled onion mash. 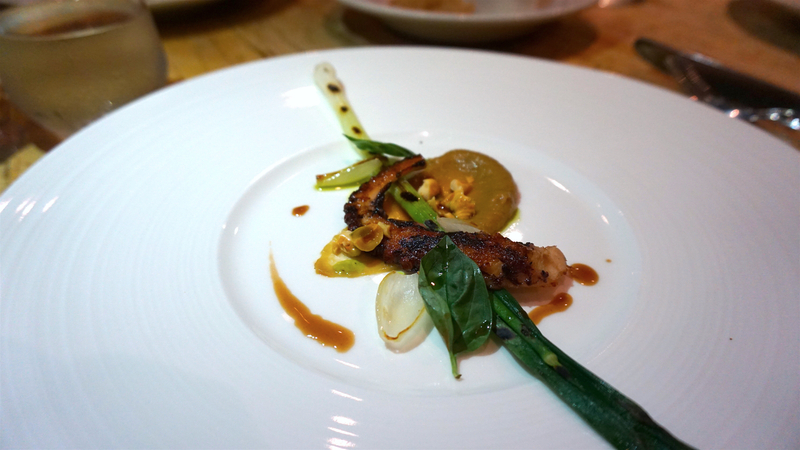 However, the Octopus was underwhelming. The fragrance was there, and there was a slight bit of char, but for some reason, it was limp. Much better was the Steamed Mediterranean Seabream. The lemon paste with broccolis and mash was a great combination, and the fish was fresh and flavourful. 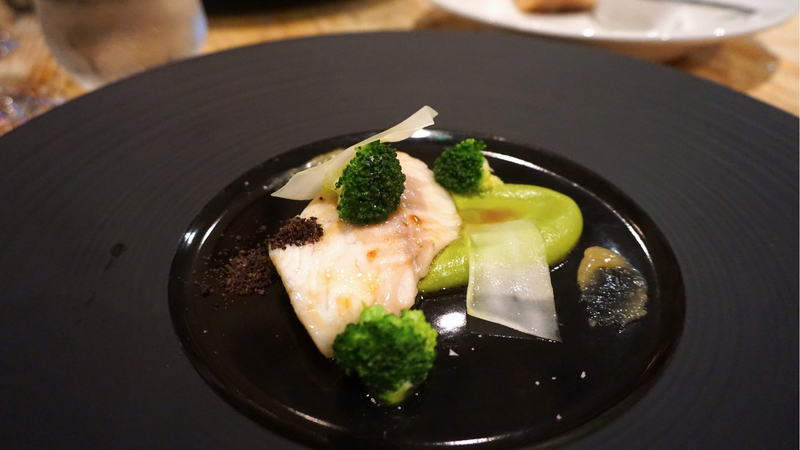 I loved how well the black olive powder went with the fish, and I’d most definitely order this again. I did enjoy the perfect seasoning and doneness of the Striploin Beef. 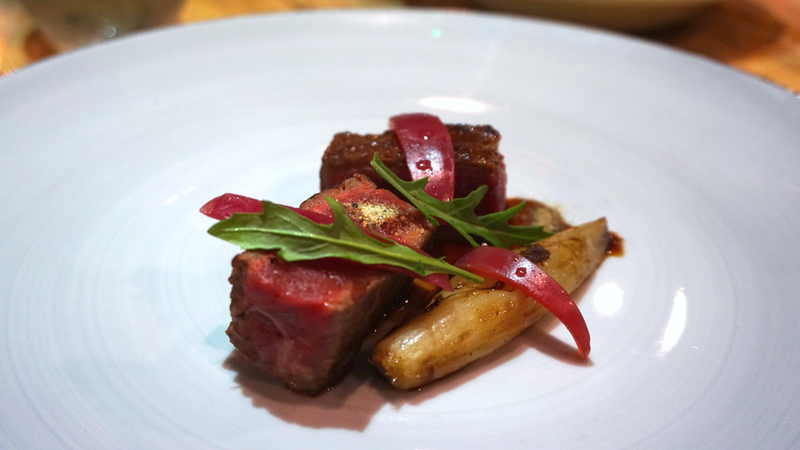 The beef is never a challenge for chefs of this standard, but what goes with the meat speaks volumes. In this case, the banana shallot papillote is phenomenal. The sweetness of the shallot married well with the smell of banana, and when it comes together with the beef? Satisfying! I’m not a dessert type of guy, but my dining table compatriots fell in love with the Dark Chocolate Ganache. What impressed them (and me) was the crunchy wafer of roasted cacao nibs that delivered an intensely bittersweet chocolate flavour. 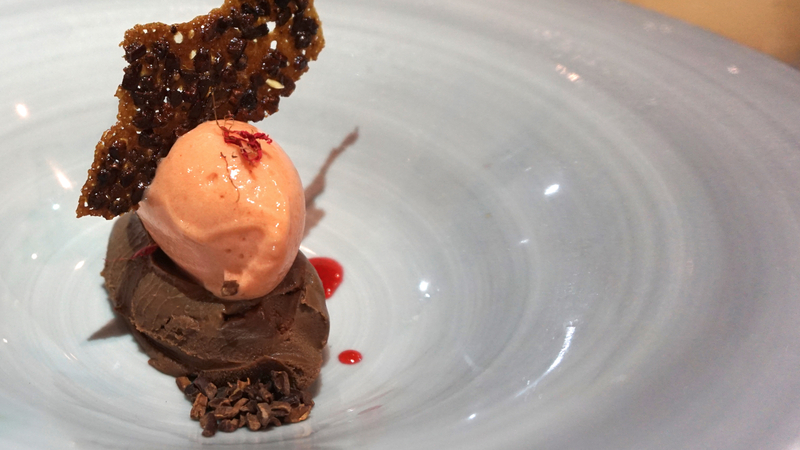 It was a solid juxtaposition to the sorbet’s floral fragrance and sweetness of the thick chocolate.